Social work's willingness to consider how social determinants affect health and its commitment to advocacy and activism to bring about structural change can help move an initiative closer to its future targets. Eat well, exercise regularly, and keep an eye on the scale. It sounds simple and straightforward, hence the misconception that nutrition, physical activity, and obesity are easily managed with just a strong dose of willpower. In reality, however, maintaining a healthy lifestyle is a challenging and multifaceted endeavor. Behavioral issues, personal history, support levels, societal attitudes, and the environment all play a role. "There are a lot of reasons why people struggle with these issues," says Wendy Hileman, PhD, MPH, MSW, MS, an adjunct lecturer in the department of social change and innovation at the University of Southern California Suzanne Dworak-Peck School of Social Work, and CEO of Healthy Adventures Foundation. "What we find," Hileman says, "is that it's super easy for people to say they want to lose weight or get healthy. But then as you talk with them, you find that they've been trying to do that for years." They've likely made many attempts to improve their health in the past, she says, perhaps successfully at times. However, they're unable to sustain the changes and they find themselves falling back into old habits. "There are obviously other factors going on," Hileman says, "and there is often a behavioral element involved, such as depression or anxiety." The trio of nutrition, physical activity, and obesity was identified as a leading health indicator in Healthy People 2020, an initiative that sets national 10-year targets to guide health promotion and disease prevention efforts. So far, results for meeting the 2020 targets have been mixed. "The Healthy People 2020 midcourse review showed meeting some targets in physical activity for adults, which is great news," says Christopher Kinabrew, MPH, MSW, chief strategy officer with the National Network of Public Health Institutes, "but little or no detectable change in the nutrition and obesity measures across our nation." Along with reducing the risk of conditions such as type 2 diabetes, heart disease, and some cancers, addressing the issues of nutrition, physical activity, and obesity can have a positive impact on mental health and well-being. "A meta-analysis of research has shown a reciprocal link between depression and obesity, with obesity increasing risk of depression and vice versa," Kinabrew says. "The evidence is overwhelming that exercise improves mental health. There is also emerging evidence from studies like the SMILES trial [Supporting the Modification of Lifestyle in Lowered Emotional States] showing improvement in mood based on interventions in food and diet." Despite the evidence that nutrition and exercise can positively impact mental health, Kinabrew realizes that addressing these issues can be difficult when clients have needs requiring urgent attention. "As social workers we often struggle with the limited time we have to address many issues that may be perceived as higher priority than physical activity or nutrition, such as homelessness, substance use, suicide risk, etc," he says, noting that, as a result, exercise and nutrition might not be at the top of the hierarchy of the needs pyramid. On the other hand, in situations where social workers do have a chance to focus on issues such as exercise and nutrition, Hileman sees a unique window of opportunity. "There are a whole lot of people who won't seek out counseling or therapy, but there are also a lot of people that are concerned about their health," she says, adding that by focusing on someone's physical health needs, "you can navigate them into the health care system, where they can access additional behavioral health resources." In working with clients to promote physical health changes, Hileman says we often use the wrong strategies and target the wrong things. She emphasizes the need to address the underlying behavioral issues involved. For example, if someone is overeating, it can be useful to explore the factors behind the person's eating behavior, asking questions such as, "How is your depression?" or "Are you feeling anxious?" Asking those questions and going beneath the surface provides a more complete picture of what's really going on. "If you don't dig deeper," Hileman says, "this person will continue to struggle and then feel like a failure when they don't succeed." To increase the likelihood of successful outcomes, it's essential that people be provided with adequate support. "If you talk to people, oftentimes you'll find that they know what they're supposed to do; they've got the basics down. But what they're lacking is the support to actually follow through," Hileman says. She describes a typical scenario where someone might receive information from their health care provider in the form of brochures, handouts, and verbal instructions. "It's too much information, too fast," she says, "and it can be overwhelming." Without support, the person may be unable to process and apply all of that information. Social workers can play an important role at this stage by offering support and guidance. "By using motivational interviewing techniques to work in that aftercare, social workers can do a great job at helping people to apply the health care recommendations they receive," Hileman says. As individuals progress on their health journey, ongoing support remains valuable. People have a natural tendency to revert back to the behaviors and habits they're most familiar with, especially under stress, Hileman says. This includes unhelpful behaviors and habits, many of which are learned early in life and reinforced through repeated use into adulthood. Ongoing support makes it easier for people to stay on track when things are going well, and easier for them to get back on track when they lapse. "The social worker doesn't need to be an expert on a particular health issue," Hileman says. "They need to be an expert on challenging behaviors, addressing the obstacles that get in people's way, and helping people to recognize their successes." "Social workers have a valuable skill set to draw from as they provide client support," says Susan J. Woolford, MD, MPH, an assistant professor in the ambulatory care program in the department of pediatrics and communicable disease at the University of Michigan Medical School, and the expert for the Institute for Healthcare Policy & Innovation at the University of Michigan. This includes behavioral therapy skills, intervention skills, and problem-solving skills, as well as their person-in-environment perspective. The ability to connect with people in their home space is an added advantage. "As they provide home visits, social workers can help families shape their home environment to better support healthy behaviors and habits," Woolford says. To bring about significant improvements in nutrition, activity levels, and obesity rates, healthy behaviors and habits must be shaped as early as possible. "We need to address nutrition with young children early on," Woolford says. "This will reduce obesity rates when they reach the teen years and older, when it's much more difficult to address." She advises that new health norms need to be established to help change current attitudes and behaviors. "It's very much like how cigarette smoking used to be viewed," Woolford says. "There was a time when smoking around children was widely accepted. Today, most people wouldn't expose children to cigarette smoke because they know the harm it causes." She explains that we need to look at nutritional issues the same way and reevaluate what we're exposing children to, both in terms of the food provided to them and the marketing targeted at them. Woolford says nutritional choices aren't made in isolation. In addition to time and financial constraints, people may have limited access to healthy food sources within their environment. At the same time, they may be surrounded by an abundance of unhealthy food options that are easily accessible, convenient, and inexpensive. There is also the influence of the food industry, which goes to great lengths to make all those unhealthy food options as appealing as possible, Woolford says. Combined, these factors can make poor choices appear extremely enticing in the moment. "But we know that these choices are going to be detrimental in the long run," Woolford says. The extent to which the environment enables access to foods that support healthy eating patterns directly impacts people's options and their ability to make healthy choices. Healthy People 2020 notes the relationship between physical access to healthy food sources and the risk for a variety of negative health outcomes, including obesity. "Obesity has nothing to do with willpower and everything to do with the political will to change the environment," says Flojaune G. Cofer, PhD, MPH, research and state policy director at Public Health Advocates. "Our habits are largely shaped by the environment in ways people often don't even realize," so we need to look at how the environment is influencing people, she says. Cofer points to the retail environment as an example of the environment's direct impact on options and the choices being made. There are numerous challenges associated with "food deserts," areas where access to nutritious food is severely limited due to the absence of full-service supermarkets or grocery stores. These challenges are exacerbated by the presence of convenience stores offering unhealthy food options, and further compounded by aggressive food and beverage marketing. "It's not as if something is wrong with us," Cofer says. "Our evolutionary design leads us to crave sugar, salt, and fat, and we've shaped an environment that has made obesity a natural consequence of that." Rather than trying to fight against our natural design, she advises that we acknowledge it while working on changing the environment. Along with changing the environment, Cofer recommends that care practitioners encourage clients to make small, gradual shifts in their eating and lifestyle choices. She emphasizes that this must be accomplished with cultural awareness and sensitivity—some of social work's strengths—especially when people are being encouraged to change lifelong eating habits. "Food isn't just a biological need," Cofer says. "It also meets emotional, cultural, and social needs." It's important to respect these needs, she says, ensuring that proposed changes are culturally appropriate. Telling someone they can no longer eat the food they're accustomed to as part of their culture typically won't yield the best outcomes. "A more effective approach would be to look at alternative ways of preparing those foods that might be healthier and more beneficial to the person," Cofer says. In pursuing public health goals for nutrition, physical activity, and obesity, Cofer says it's important to be cognizant of the associated issue of childhood trauma. "The more trauma that a child experiences before the age of 18, the more likely they are to experience a range of chronic health issues as adults," she says. This increased risk includes obesity, along with other chronic conditions such as hypertension, diabetes, cardiovascular disease, and substance use disorders. The link between childhood trauma and adverse health outcomes in adulthood needs to be examined more closely, Cofer says, noting that public health is already moving in this direction. Given the breadth and complexity of childhood trauma, Cofer believes the issue requires collaboration from a number of partners from a variety of disciplines, one of which is social work. "We need a comprehensive approach that goes from the macro to the micro level," she says. "If we don't address trauma and its impact on health, we're really missing out." By contributing to a more sedentary lifestyle, the ever-widening reach of technology is sometimes viewed as having a negative impact on health. Woolford, however, believes technology can be leveraged in constructive ways to enhance health interventions. "While the use of technology among youth has been viewed as a contributor to the obesity epidemic, information and communication technology may also be a key component in reversing this problem," she says. For example, take Pokémon Go, an immensely popular mobile game that encourages users to be outdoors and physically active. "Mobile applications that target youth and their parents—particularly those that incorporate gamification to increase engagement—offer a promising means to increase users' motivation to adopt healthy habits," Woolford says. Woolford also notes the ability for mobile technology to be utilized by all populations: "Access to mobile technology crosses income and race/ethnicity divides, making it possible to reach those most significantly impacted by excess weight." In addition, digital tools make it possible to offer people customized solutions, increasing the likelihood of engagement and treatment compliance. "[M]obile apps can deliver individually tailored content that is personally relevant to users based on their actual behaviors/preferences, and advances in artificial intelligence will likely make these apps more effective," Woolford says. She notes that, with cross-sector collaboration and targeted funding to create an appropriate evidence base, there's an opportunity for these tools and other novel mobile health interventions to be incorporated into obesity prevention and treatment initiatives. In regard to future efforts, Kinabrew says, "Healthy People is our nation's opportunity to collectively set goals—and we set a lot of them. I am not certain more goals are what we need." He suggests considering updates in two areas: to cross-link (to the extent possible) the nutrition, physical activity, and obesity goals with behavioral health goals and to enhance the listing of evidence-based resources. Social work practice has much to contribute as the 2030 objectives are developed, according to Abigail M. Ross, PhD, MPH, MSW, an assistant professor in the Graduate School of Social Service at Fordham University. 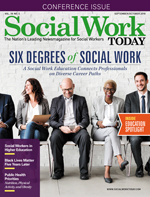 "Given that social workers are leaders in the field of interprofessional collaboration, I hope that social work has a voice and a seat at the table," she says. Ross notes the breadth of expertise social work can offer to help achieve public health goals. "Social workers are well equipped to intervene at individual, family, community, and societal levels," she notes. However, to effectively harness that skill and expertise, Ross sees a need to "collectively shift our approaches to include a public health social work (PHSW) perspective—which includes a substantial focus on universal prevention and health promotion—in addition to targeted and indicated prevention and treatment." Ross highlights the useful approaches that a PHSW encompasses, such as "its willingness to investigate social factors as causes of poor health, use of epidemiologically informed clinical and community-level preventive interventions, and commitment to advocacy and activism to bring about structural change." Social work practice also has much to offer regarding care integration. "Many social workers, especially those working in administration, are well positioned to influence how systems of care and referrals look at [physical] health and behavioral health as connected," Kinabrew says. Along with understanding a person in an environment, Kinabrew notes that social workers also understand the positive and negative impacts policies can have at the individual level. "As we help develop and achieve public health goals, social workers should not be shy to voice concerns about unintended consequences such as isolation, shaming, etc," he says. "We know as much as any profession about personal behavior, as well as the policy, systems, and environments impacting people in their day-to-day lives." — Susan A. Knight is a freelance writer with a focus on health and wellness.